The Fellowship was fortunate enough to obtain a copy of SAGA #3 from Image Comics. Brian K. Vaughn writes, Fiona Staples is the artist, and Fonografiks letters. In their escape, Marko and Alana meet Izabel, a young lady with a problem: she wants to leave Cleave. She can only do so if she bonds with a native, though, but baby Hazel was born there, but can Izabel talk Alana into it? And the couple’s previous employers are looking for them; the military is funny that way. And it doesn’t help that Marko is mortally wounded. This is a very complicated story, and that’s totally a compliment in this case. It’s got it all: alien races, supernatural creatures, military conquest, terrorists (freedom fighters, if you prefer), and a robot monarch with a TV for a head. But with all of that going on, it all comes down to what a parent will do for its child. Love and sacrifice, tearing apart your own life to make a better one for your offspring. There’s a moving story in there, and it’s wrapped up in a fascinating and complex world. This book truly lives up to its title. 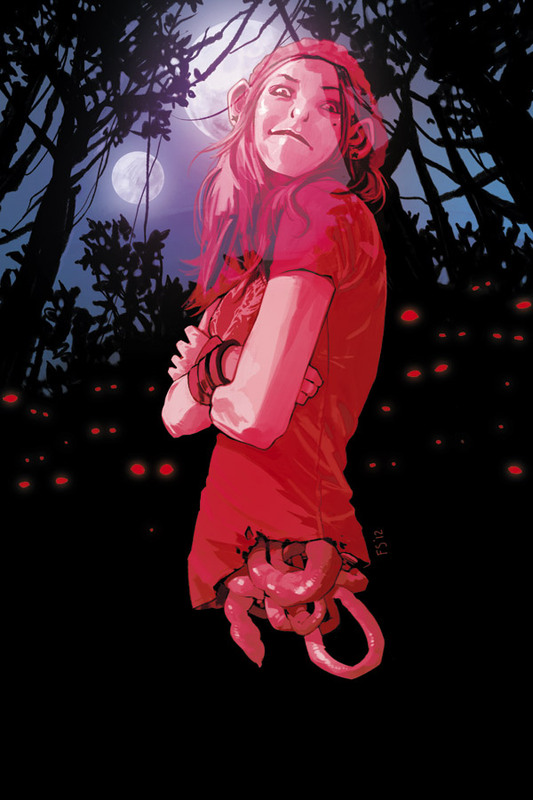 SAGA #3 is available now at your FLCS or by order from imagecomics.com.